Editor’s note: In England, Canada and Australia, the commonly used word “pocketbook” (a hard-sided handbag) has been replaced by the generic term, “handbag,” and the word “purse” (a ladies coin purse) is now called a “wallet.” For the sake of clarity in writing today’s column about handbag organization, all bags (hard or soft sided, shoulder or 2-handled and/or clutch) will be called a “handbag.” The only bag not considered a handbag is a “tote bag,” but that’s another story altogether. I know a woman who hungers for a real Chanel handbag more than life itself; the funny thing is she’s probably spent as much money buying fakes as she would had have she bought the real thing. What’s even funnier is when given the opportunity to buy a real Chanel handbag, albeit a little tired and worn, she claimed it was a fake (not) and gave up the chance to own a “real” vintage Chanel bag. Cognizant that a great handbag not only makes a fashion statement, but also makes you feel as though you’ve arrived, you’d never see a French woman, no matter how rich or poor, carrying cheap version (i.e. : fake) of a Louis Vuitton, Dior, Gucci or Chanel handbag. Despite the fact it’s against the law to sell counterfeit designer handbags in France, this thought would never cross a Parisian’s mind. No matter what you spend on your handbags, treat them as you would any investment, with kindness and respect and they will last a lifetime, which means not piling them one on top of another and not cramming a multitude of handbags into a cubby or milk crate, or worse, throwing them in a pile on the floor or on the top – and invariably dusty – shelf in your closet. Before you can organize your handbags, you need to spread each and every bag out in front of you and then, with a judicious eye, decide which handbags you really love, really use and really want to keep. Then, going forward, you really need to resist the temptation to buy the same handbag in multiple colors just because you think you’re getting a good deal, and never buy something if it only goes with one outfit. Today’s column includes several ideas to help you decide how best to store – and protect – your handbags. As an aside, I personally don’t like the “over-the-door cascading purse racks” available at Bed Bath & Beyond. Not only are they space hogs, but also it’s next to impossible to move all the bags around in order to get to the one bag you want to use. Tired of trying to figure-out how to store large handbags and tote bags? I actually designed this system for a client, which has since become my “signature” solution. All it takes is a metal curtain rod, two metal “closet rod supports” and a box of shower curtain hooks (not shower curtain “rings”) to put this system together. If you are installing the rod into drywall, be sure to anchor the rod supports securely into both walls. 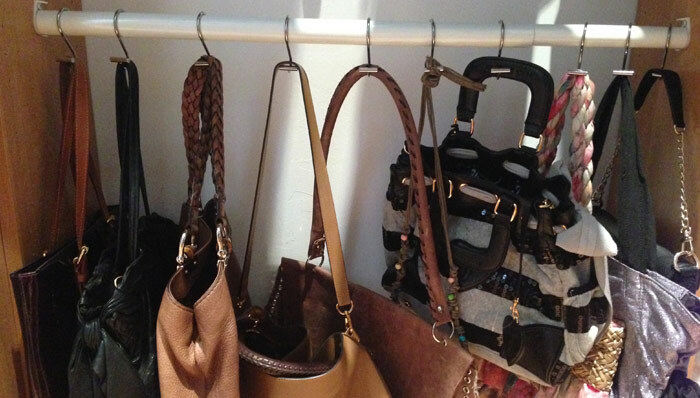 I simply don’t have the time – or patience – to switch-out my handbag every time I change my clothes. Adhering to my philosophy, “less really is more,” my personal handbag collection is carefully edited to include only those bags I love and use. Although I store my larger bags on the top shelf of my closet, I prefer hanging the smaller ones from a series of Command-brand hooks, which are placed on empty wall space in my closet. Vertical Plexiglas dividers are the ideal way to keep handbags from toppling over one on top on another. For smaller evening and clutch bags, there’s nothing better than using a deep drawer for storage and easy access. Do not stack bags on top of one another, rather, stuff them with tissue and, if possible, wrap them in the dust covers that many better handbags come with when purchased. However you decide to store your smaller handbags, do not store them in Hefty-brand or Ziploc plastic bags! If you don’t have a cloth dustcover, gently wrap the smaller bags with tissue paper. A friend of mine stores her handbags and shoes in beautiful gold-colored organza bags. I love this idea, not just because the bags allow her to see her handbags, but also because it’s a beautiful way to protect and display her smaller handbags.